Penguins of Madagascar is an upcoming American 3D computer-animated action comedy film, produced by DreamWorks Animation and distributed by 20th Century Fox. 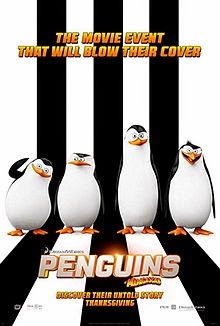 It is a spin-off of the Madagascar film series, and a sequel to Madagascar 3: Europe's Most Wanted, following the penguins Skipper, Kowalski, Rico and Private in their own spy thriller.Apart from the main characters, it is unrelated to the The Penguins of Madagascar series (which is set in its own continuity). The film is directed by Simon J. Smith and Eric Darnell, and written by Michael Colton and John Aboud.It stars the voices of Tom McGrath, Chris Miller, John DiMaggio, Christopher Knights, Benedict Cumberbatch, John Malkovich, and Ken Jeong. The film is scheduled to be released on November 26, 2014.